Mat Jackson has enjoyed more BTCC success at Silverstone than at any other circuit and the former championship runner-up will be targeting his fifth victory at the home of British motor sport this weekend. The Airwaves Racing star claimed his first win of the season – his 20th BTCC victory overall – at Knockhill last month and currently lies sixth in the standings after an impressive year to date. He had been as high as fourth after his tremendous display north of the border and he remains embroiled in a fight for that position with reigning champion Andrew Jordan and eBay Motors’ Rob Collard. Despite another hat-trick of scores at Rockingham the Wrotham-based team were largely fighting for positions in the lower end of the top ten last time out, but admirable consistency has been the impressive hallmark of the squad’s campaign. Jackson has taken points in 23 of the 24 races so far this season, a theme he’ll be hoping to continue this weekend. The circuit holds fond memories for both Mat and the team as they scored their first NGTC victory there together in the Ford Focus back in 2012. The 33-year-old and his double champion team-mate Fabrizio Giovanardi will be receiving extra support this weekend too after the team launched a new partnership with one of the world’s leading manufacturer and marketer of major home appliances, Whirlpool Corporation. 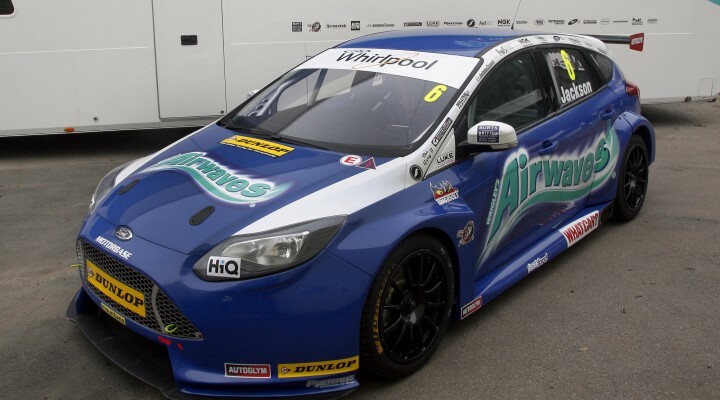 Whirlpool and its guests will be cheering on the Motorbase-run squad and adorning the screen headers of the Mountune-powered Ford Focus ST’s as new team partners for the final two rounds of the 2014 season. “It is wonderful to get involved in the exciting brand values and passionate nationwide fan base of Airwaves Racing and Mat Jackson, and we wish them the very best of luck for the last two rounds of the season,” said Darren Harrison, Whirlpool’s Managing Director for UK and Ireland. Although the current deal only runs for the next two events Team Boss David Bartrum says he is looking forward to a ‘long and successful partnership’ with the brand.